In the first half of this article I defined the term organic warfare, considered other games as counter-examples, and went over some of the factors that allow the Hegemony titles to deliver this rare experience. 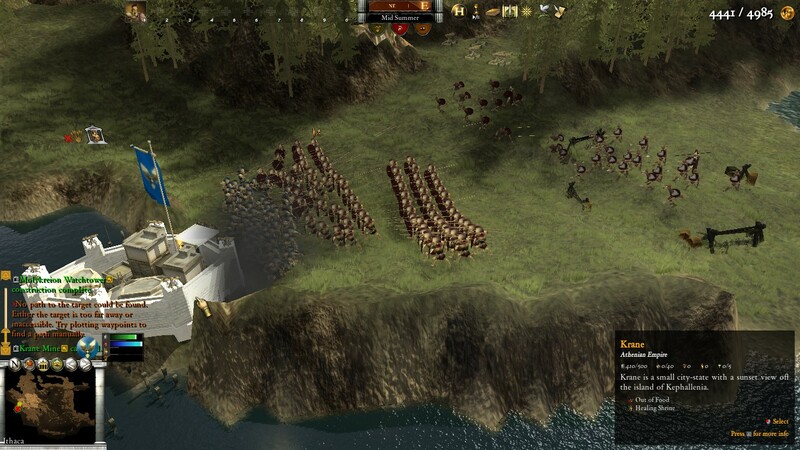 These included their near-exclusive focus on war; their single-player, real-time nature; their skillful AI; and their elegant handling of logistics, troop movement, combat, and siege. Of course, that roster is not exhaustive, so I may end up addressing other aspects of their design in this half. Now, as promised, I will examine the gameplay in greater detail, attempting to determine exactly what feels organic and why. Beginning at a broad level, warfare in Hegemony comes in two main flavors: invasions and raids. The player expands by launching large-scale assaults into hostile territory, and must repulse enemy armies to hold onto conquered lands. When manpower is lacking, the player can send smaller raiding parties, weakening foes too powerful to destroy outright. The AI loves to do this, constantly harassing the player’s borders and coasts, though different factions have varying aggression levels. From a tactical perspective, troops may engage in many types of military action, most importantly reconnaissance maneuvers, skirmishes, pitched battles, sieges, and blockades. I covered raids a bit in the previous piece, stating the natural value of light infantry and cavalry in carrying them out. These swift units can dash in and out of enemy territory with impunity, capturing unguarded possessions, burning farms, and disrupting supply routes. Most cavalry will need to flee if the enemy mounts any reasonable defense, but light infantry can actually defeat enemy heavy infantry by darting around open terrain and turning to hurl a few javelins when they’ve fled to a safe enough distance. 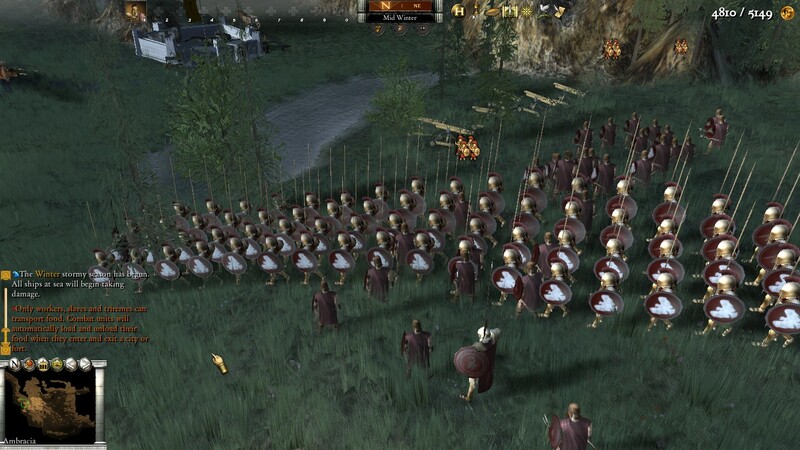 With sufficient care, 10 peltasts can defeat 40 hoplites, or at least distract and annoy them for a long time. This may sound like an exploit, but it doesn’t feel like one. 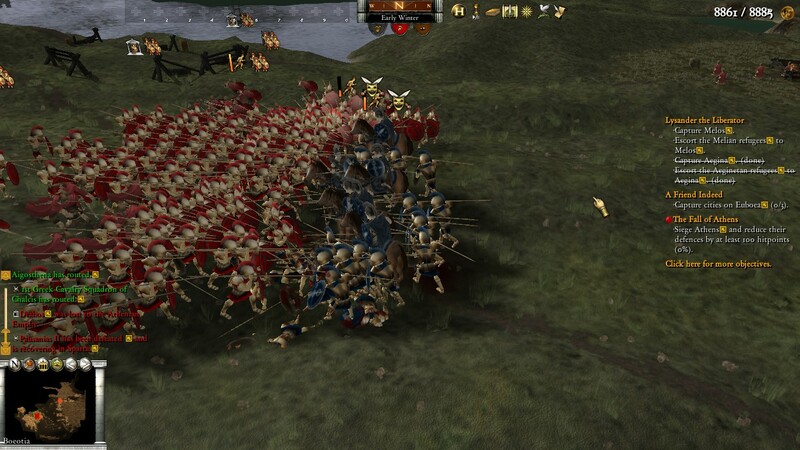 AI hoplites will charge if they have the stamina, so the player’s fragile light infantry need to be carefully managed, as they’ll rout quickly if caught in close combat. Furthermore, enemies won’t stray too far from home, and will retreat if in serious trouble. History also supports the power of hit-and-run tactics. Greek light infantry proved so effective that hoplites shed most of their armor over the course of the Archaic and Classical periods, their iconic bronze panoply eventually reduced to a metal skullcap and shield. This was an attempt to increase battlefield mobility, awareness, and endurance, as peltasts were running circles around the ponderous phalanxes. 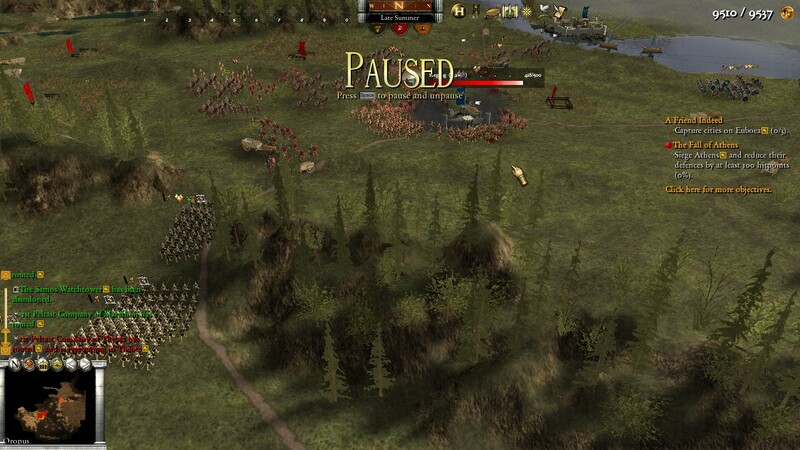 If anything, Hegemony doesn’t go far enough, as forests and hills don’t slow heavy units or benefit light troops. According to Thucydides, Athenian and allied hoplites suffered a shocking defeat at the hands of local skirmishers in Aetolia due to exactly such rough and unfamiliar terrain. Even though the game doesn’t incorporate this advantage, the light infantry maneuvering it does allow is nevertheless realistic. Since this is such a good way of dealing with enemy hoplites, defensive garrisons often benefit from the presence of peltasts. 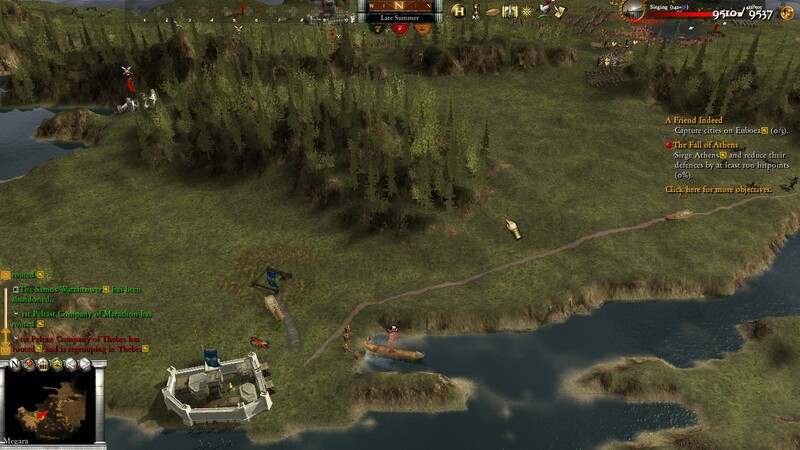 Cavalry can drive off enemy skirmishers and hurry from town to town in response to shifting threats. 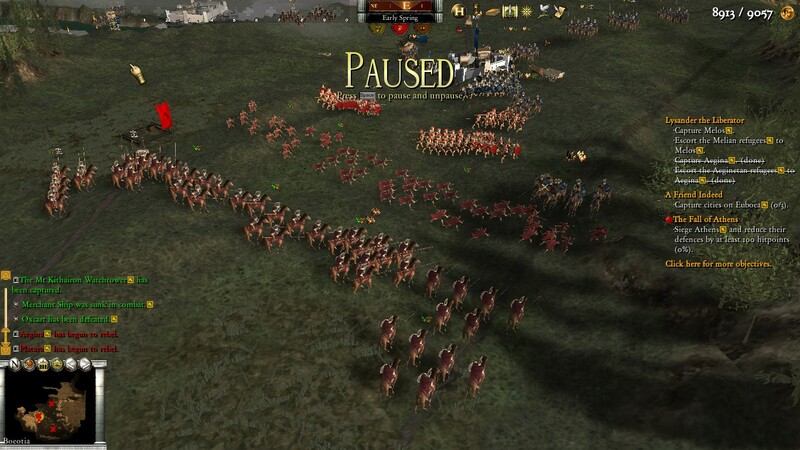 Heavy infantry are essential for holding narrow passes or fighting off large invasions, while cheap spearmen are good for keeping the peace, since occupied towns will rebel if left empty. 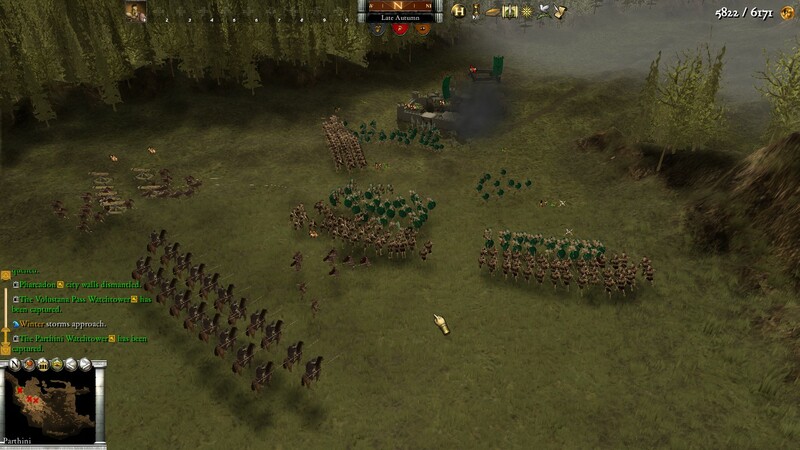 Each faction boasts different unit types and aggression levels, so the player needs to constantly tailor his defenses as his borders grow and his armies march for new fronts. The AI seems to have some sense for when a region is poorly manned, and negligent players can expect to face incursions until the frontier is strengthened. Likewise, the AI won’t throw itself at an impregnable fortress, though it may well send minor raids. 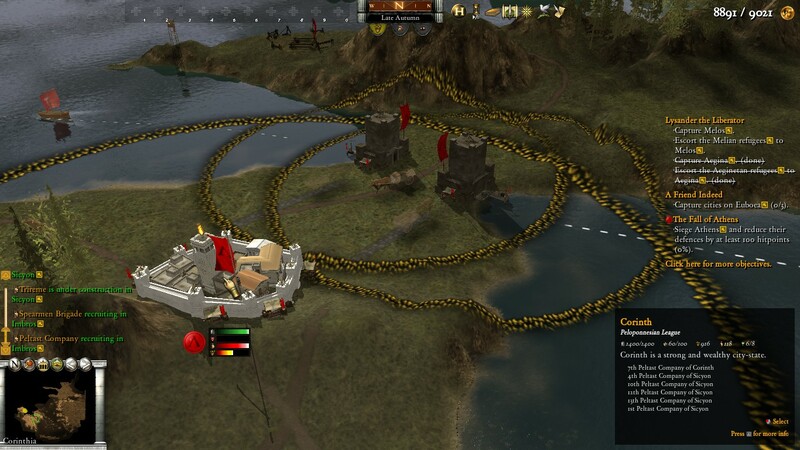 Watch towers are an indispensable component of defensive strategy, giving the player time to prepare appropriately when the enemy crosses the border. Offensive intelligence is no less critical. There is no espionage system, so cavalry or ships can provide necessary reconnaissance. After scoping out an area for conquest, the player will need to prepare, as haphazard invasions are guaranteed to fail. Good preparation is complex. First, a route must be chosen, by land or sea. Most areas have multiple natural approaches, each with drawbacks and advantages, so this can be a critical choice. The Isthmus of Corinth won’t fall easily. Better approach by sea, or land elsewhere in the Peloponnese and come up from behind. Next, an army of sufficient size, with an appropriate unit mix, must assemble at a staging point. 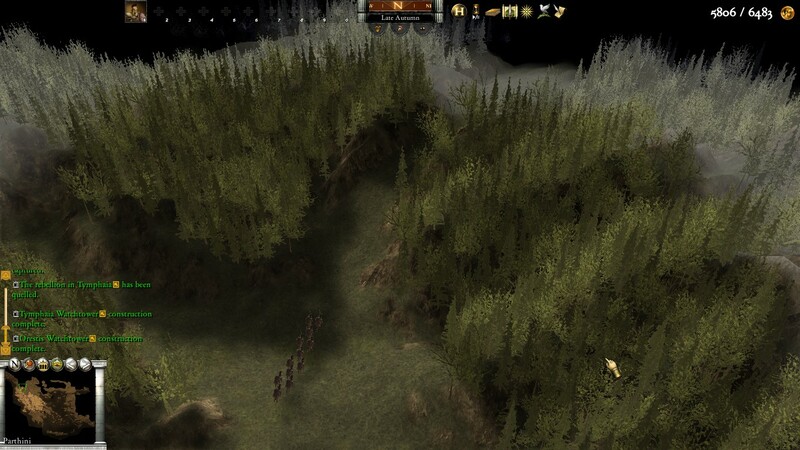 This can be a city, a fort, or even a field; Hegemony includes a “camp and forage” command to facilitate this last option. If the best location happens to be in hostile hands, the player may want to launch a preliminary assault. For example, in my Sandbox campaign with the Phocians, I conquered the Athenian-held island of Corcyra to serve as a naval base for my invasion of Epirus. Scyros and Aegina fulfilled the same purpose in the strategic action which opened Part 1 of this article, part of my Ionian War game. 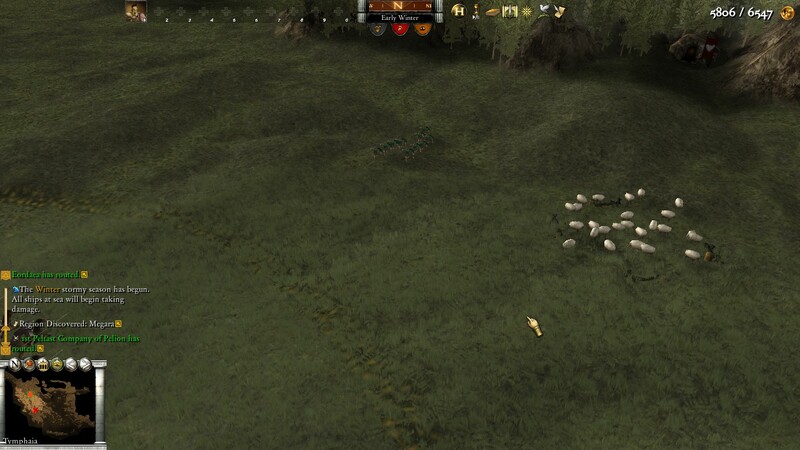 Get away from my sheep, dammit! …so the time to invade mountainous areas may be the end of autumn, as the AI will quickly send units to haul the lambs into the safety of their cities. Since ships can’t move long distances during winter, spring or summer are most auspicious for long-distance naval movements. All that said, there is flexibility here: food can be transported manually, beached ships recover health, and so on. The game guides the player in realistic ways, but clever planning can overcome its barriers. Once the invasion is underway, the player must take care to see it through. For example, sending a screening force of empty triremes can save the men aboard a transport fleet; even if the scout ships sink, no soldiers are aboard them to drown. Likewise, the player may not want to send infantry to assault a city’s walls right away. At any time, the whole garrison can come pouring out, overwhelming the besiegers. In many cases, the superior option is to lure the foe into a pitched battle outside. 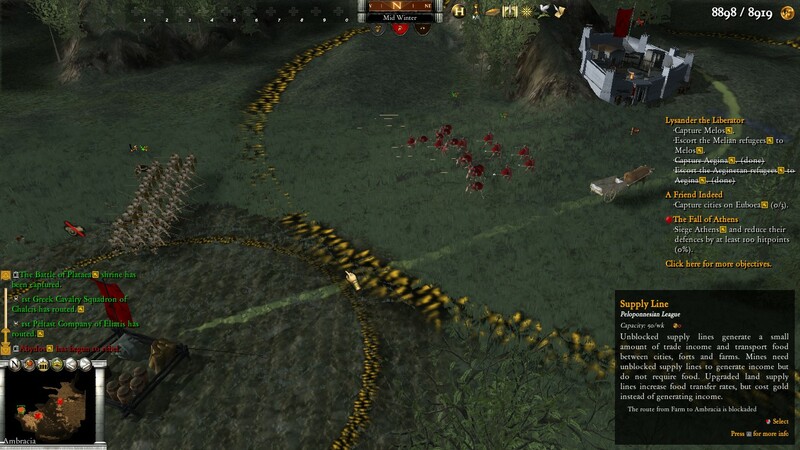 The AI isn’t stupid enough to come out for no reason, but the player can draw them out by ravaging the countryside: seizing mines and forts, capturing or burning farms, and blocking off supply routes. Catapults can cause serious damage to walls without exposing themselves to danger, forcing the enemy to sally forth to destroy them. 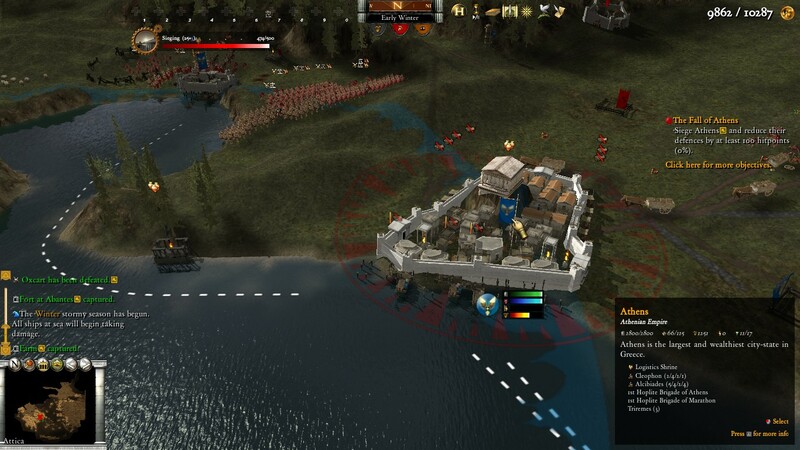 Decoy attacks can send AI reinforcements running to other towns, leaving the player’s true target undefended. Again, enemies are smart about this, and such a diversion has to be well executed. When it works, it feels natural, as though you’ve just outsmarted an actual foe, as opposed to tricking some dumb algorithm. These all seem like natural considerations and strategies for an ancient general. Let’s take a moment to examine pitched battles more closely. 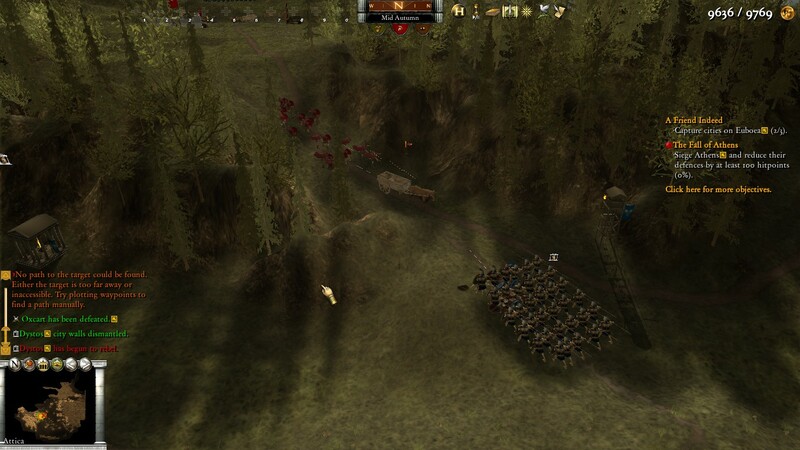 Geography heavily affects their course; for instance, a battle in a narrow pass will likely be determined by the quality and quantity of heavy infantry present on each side. 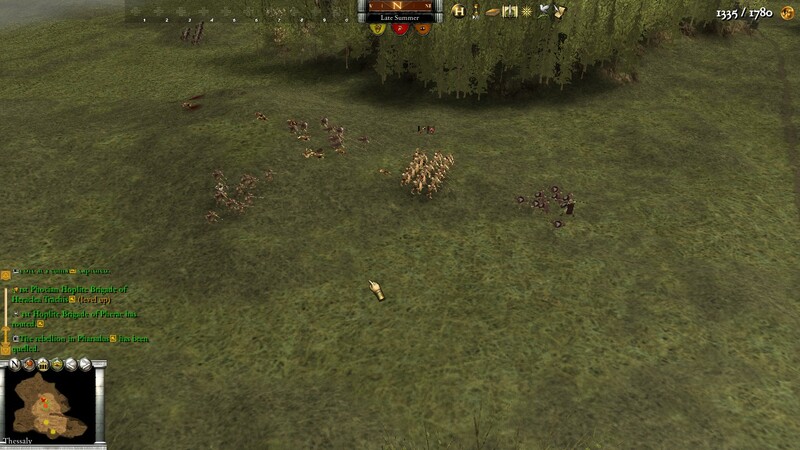 Open fields favor cavalry and flanking maneuvers, though a battleline of phalangites or hoplites is essential as well. 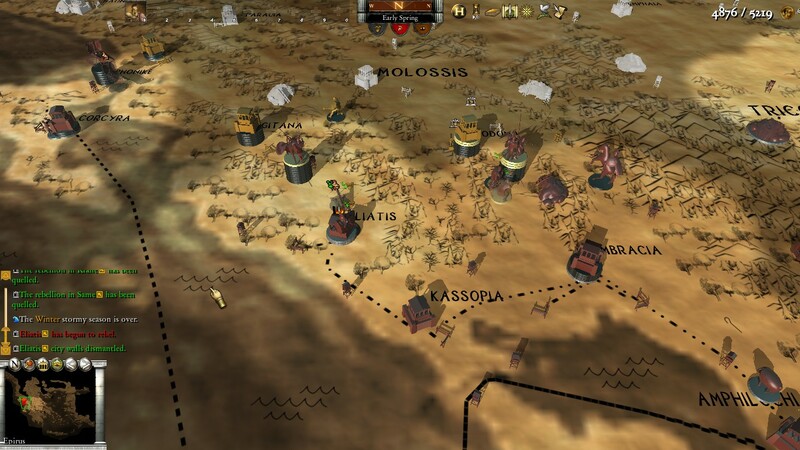 Hegemony’s map, which is based on satellite imagery of the Aegean region, offers a wide variety of terrain to fight in, keeping the player on his toes. The forces required to invade the mountainous kingdom of Epirus are quite different from those needed to subdue the tribal horsemen of the Danube valley or take on the Athenian maritime empire. 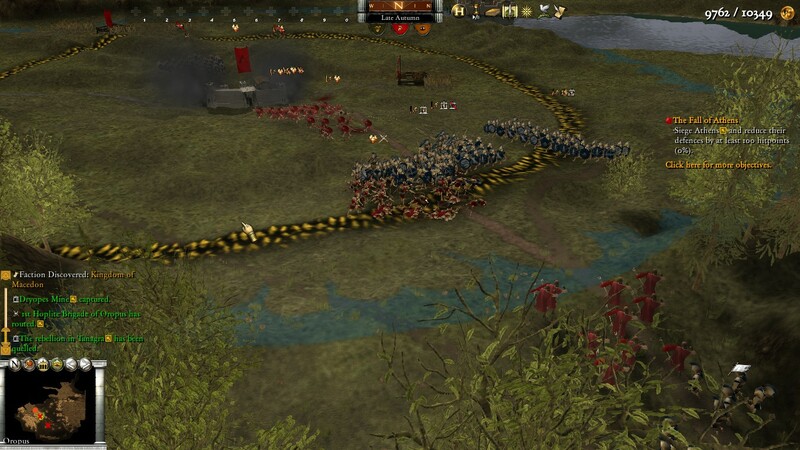 As a rule, though, mixed-unit tactics will win the day. Battles follow a natural sequence of shock, melee, and pursuit, and different unit types are built for different phases. 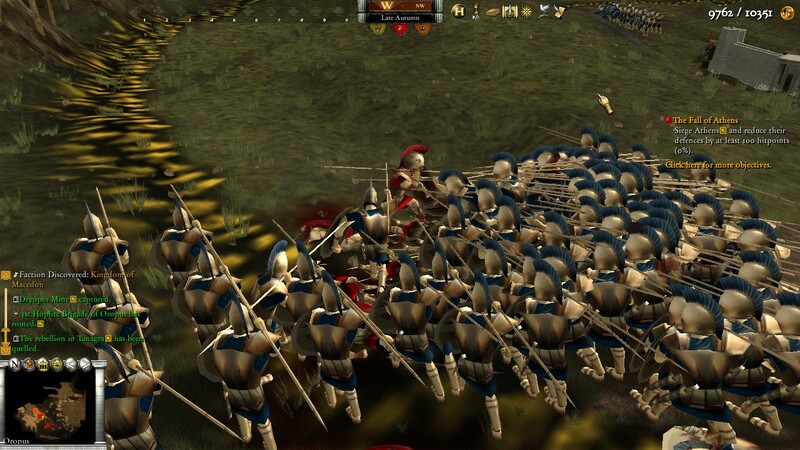 Heavy infantry can defeat other troops in close combat, but when two hoplite squads are duking it out, light infantry support can give one side the edge. Quick-moving cavalry are ideal for charging peltasts and chasing down fleeing foes, but won’t last long in hand-to-hand fighting. All this is fairly standard, but what’s amazing is how battles seem to just happen, and how naturally each unit’s attributes feed into the system to create an organic command experience. Proper “battles” rarely happen in many games; for example, Civilization tends to have amorphous, drawn-out wars. 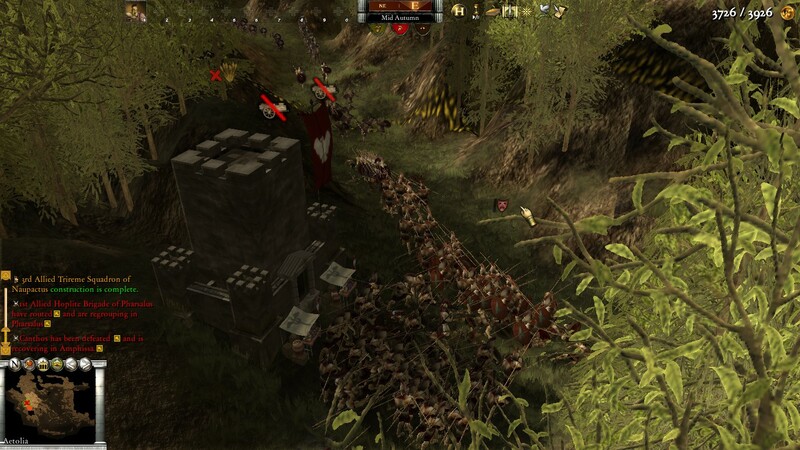 Total War games bring them about by a clear contrivance: opposing armies passing near each other are obliged to engage in formal combat or else retreat a fixed distance. In Hegemony, the transition from strategic to tactical movement is seamless, but proper pitched battles still occur—just like in real life! This is, to me, the epitome of “organic warfare,” and quite probably the main reason I’m writing this article. Cavalry are useful in reconnaissance for the exact same reason they’re useful in pursuit. 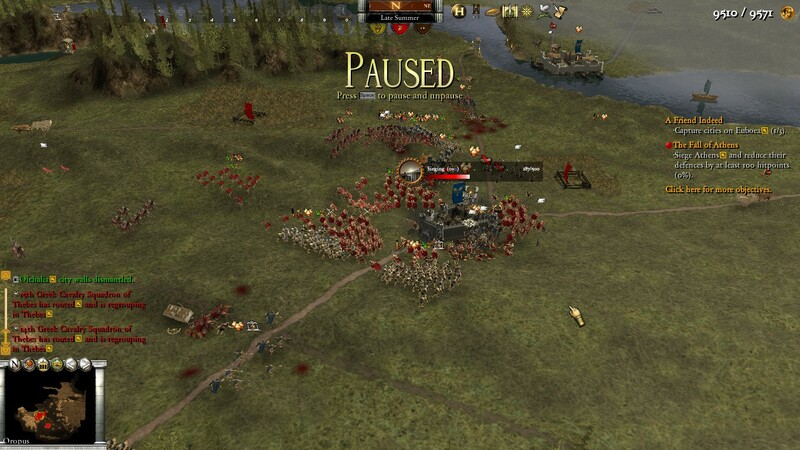 The large size of heavy infantry units makes them hard to maneuver and feed, but indispensable in melee and siege. Their “armor” may be abstract, represented by statistics of speed and defense that bear no necessary relation to each other, but it’s easy to imagine one factor both slowing them down and making them hard to kill. Everything just makes sense. And it’s not just an internally coherent system: the history matches up too. At the start of the Peloponnesian War, King Archidamus of Sparta ravaged the Attic countryside. Confident as the Peloponnesian troops were in their combat superiority, they nevertheless lacked the technical skill to overcome the Athenian Long Walls. Pericles, knowing that the city could be supplied by sea as long as those walls held, forbade the Athenians from marching forth, refusing to risk the security of the city in a pitched battle against the dreaded Spartan war machine. Year after year, the Spartans and their allies returned to burn the fields, but they accomplished almost nothing of value. (They did accidentally facilitate the spread of the devastating Athenian plague by penning up a huge population in a space not fit to hold them, at least not under sanitary conditions.) Meanwhile the Athenians raided the Peloponnesian coast, harrying the Spartan allies and wearing down their reserves of patience and money. Plague aside, Hegemony allows for very similar events to happen unscripted. Huge quantities of food can be transported by sea over any distance; the system of population and recruitment allows for wars of attrition; and sieging a well-stocked city by land is a slow and dangerous process. This last factor goes double for the Peloponnesian War campaigns in Wars of Ancient Greece, where catapults are not available. A note on catapults. Philip’s use of these weapons represented a major advancement in offensive siegecraft, greatly reducing the time and danger involved in taking a city by force. Therefore their power makes sense in Philip of Macedon. However, they do feel out of place in the second Hegemony title’s Sandbox mode: while the player can build them as any faction, the AI never does so. From a design perspective, this imbalance may make up for the lack of “objectives,” which provide bonuses when completed in the other campaigns. While the exclusive ability to use catapults gives the player a similar boost in the Sandbox mode, perhaps maintaining the right challenge level, it feels like an unnatural advantage. 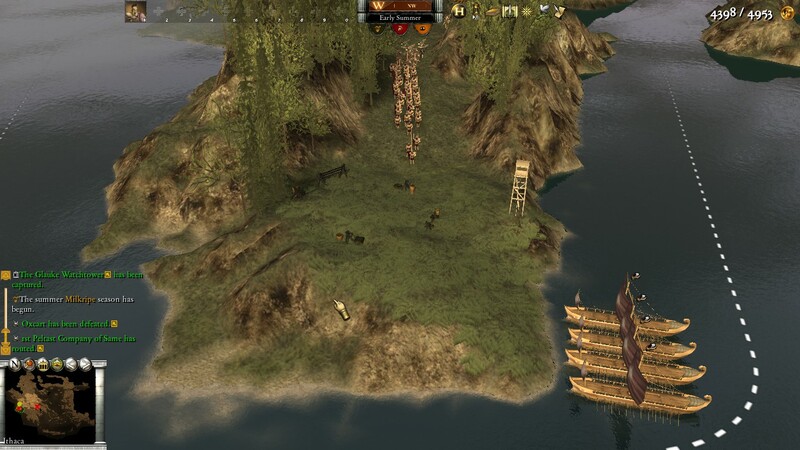 However, on a similar topic, the game perfectly demonstrates the military role of citadels and forts: they are bases from which armies can march out against invaders, and to which they can retreat when threatened. If you have ever wondered how a castle actually controls the countryside, there you have it. Borders in Hegemony, while shown on the map, are fairly abstract: soldiers do not follow different rules of movement, supply, or combat in enemy and friendly territory, as they do in many games. It is a testament to Hegemony’s organic nature that the conquest of towns and forts remains nevertheless critical for the safety of advancing armies. A final point: these fortified bases represent such major obstacles that virtually every one requires a conscious plan to seize. Aside from keeping the player constantly engaged, this engenders a sense of gradual conquest which seems appropriate to the period. There was no Hellenic blitzkrieg. Rather, massive armies often failed to take tiny walled towns, or at least only succeeded in doing so after long months of siege. The story of the ten-year Trojan War, while exaggerated in the details, is a good illustration. 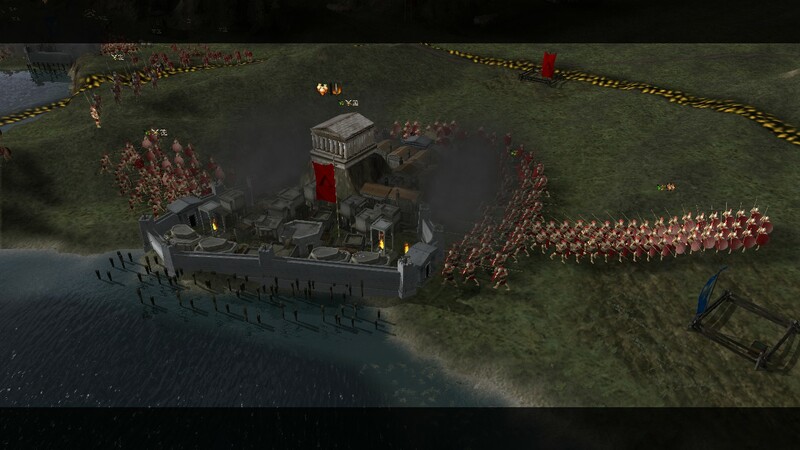 As mentioned, though, catapults do upset this balance, as does the new alliance option in Wars of Ancient Greece, which essentially causes an entire faction to join the player for a fee. Diplomacy was a major factor in ancient Greek interstate politics, but Hegemony does not handle it well. Still, to focus purely on the military, Hegemony creates an experience like none other. When I studied ancient history in college, I read about all these things: the impact of geography, the importance of logistics, the convenience of naval transport, the difficulty of siege. But I didn’t know exactly how they worked. Hegemony brings them to life in a way that makes it all click better than any other strategy game I’ve played. To return to where we started, perhaps that understanding is what allowed me to conquer not only Oichalia and Megara, but Tanagra as well. It was a fiercely fought battle, with hundreds of casualties on both sides, but by the end my Peloponnesians stood on Athens’ doorstep. It wasn’t long until we swarmed beyond Eleusis into the great city herself. A generation of war had ended. We had won. What a great article! I also studied history and have played many historical strategy games but none have quite allowed me to FEEL history like Hegemony did. ‘Organic’ is a perfect way to describe how the systems become transparent and you find yourself feeling history seamlessly ‘happen’ as you move throughout the different geography. I hope whatever magic Longbow managed to code into Hegemony Greece finds its way into Hegemony Rome.